Please note to all those who have emailed I am replying but there seems to be a huge delay or messages not getting through .Only 2 beautiful little boys left. Absolutely stunning and so tiny they are the most lovely little chaps. Mum is our much loved family pet and has the best character she is truly the best companion. 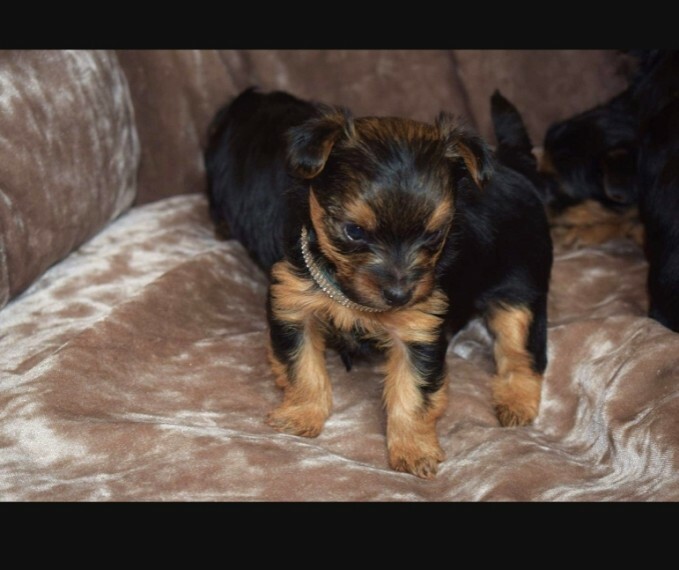 Dad is a KC reg small Yorkshire terrier. Dads KC paper work will be provided in a puppy pack to take home with your little ones when they are collected at 8 weeks of age on the 14th of November. Puppies are being raised in the heart of our home with lots of cuddles and will be used to all household sights and sounds.They get lots of cuddles from the whole family. A sample of food. a collar.toys and a blanket with mums scent on plus some puppy pads to get your little one settled in will be included. Puppies will come vet checked.with 5 weeks free insurance.They will have their microchips plus flea and worm treatment up to date. Yorkshire terriers make great pets for allergy sufferers as they have non shedding coats. 100 non refundable deposit holds the little one of your choice until they are ready for new adventures. If you would like any more information or to arrange a viewing please email.